A sound structure with high mobility is very useful for marketing campaigns of any sort. Design one with a cover that displays your organization's brand or color scheme so it can represent you anywhere you take it. They are round semi-spheres with sleek looks and incredible ease of use. They are great for both indoor/outdoor marketing and their large size offers you, the user, great exposure as they always attract large crowds of curious passerby. Host an event without needing equipment that requires assembly with many, many parts. All you need is an inflatable dome structure, the dome cover, an air system and some tethers to tie it down, all of which are included with every one of our inflatables. As if that was not enough, it can all be installed in a matter of minutes by 2 people. This is truly revolutionary as doing something like this in the past meant having to take many different parts, a large crew and perhaps multiple days of installation and set up. What about putting it all away, well, it's just as easy. So, not only can you do this in a matter of minutes but you can also customize the stylish structure to your liking. "Who wouldn't want to get a drink from inside an inflatable dome?" Our inflatable domes come with cool stuff already packed in. They are amongst the simplest in design but that is what makes them elegant. They dont have unneccesary shapes, countours, or "bells and whistles" that deviate from the simplicity of the design. The other benefit to their simple design is that they can be printed on and the images, logos and signage will not be altered in a way that they are not recognizeable. It's essentially a giant banner that you can take with you with the perks of being an inflatable structure. All of our inflatable structures are built to the highest inflatable safety standards to ensure they will not collapse, deflate, tear, rip or even fly away. The materials they are made of are extremely heavy duty vinyls that will keep the structures together without any air leaks that would compromise the dome's stability. The reinforced areas to tie down the inflatable will not give out when placed under normal stress, rather they will hold the inflatbale structure secure to whatever you choose to tie them down to. If an inflatable is exposed to winds higher than 15MPH we reccomend that they be taken down for safety purposes. 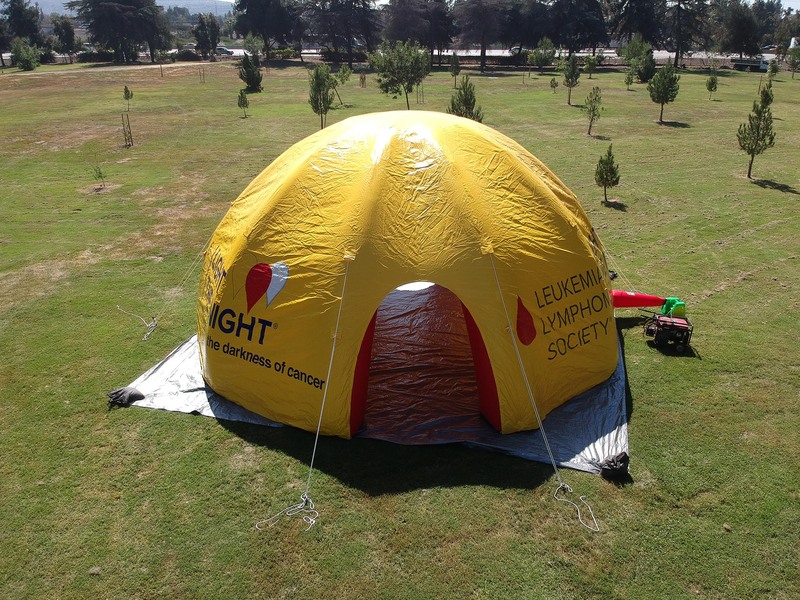 Would you like to see more detailed photos of our cool inflatable domes? Check out our mini gallery below!